Ideas for Bridal Shower Centerpieces! Great ideas for Bridal Shower Centerpieces! Modern ideas are combined with items that can be purchased as centerpieces or craft projects producing the most unique homemade centerpieces. Decide whether you want a modern or traditional table centerpiece, one that is purchased or a homemade centerpiece, practical or elegant, unique or quick to make! Origin and History of Centerpieces! The origin and history of centerpieces date back thousands of years! A centerpiece (or centrepiece) is the most important item of a table setting display or as a central or important object. An object placed at the center of something (as on a table). The purpose of table centerpieces are as decoration, epergne, ornament or any form of ornamentation. Table Centerpieces are highly prominent or decorative items which act as the focal point of a celebration. Special occasions were celebrated with feasts or banquets and the table centerpieces for such occasions were items such as the main dish being served, lighting and flowers and plants. An epergne was the name given to a large table centerpiece with branching holders for fruit or sweets or flowers. These particular types of table decorations often consisted of several dishes or receptacles of different sizes grouped together in an ornamental design. In modern times we still use table centerpieces at family meals and celebrations and of course at Wedding receptions where the table centerpieces are the cake and flower decorations. Different Themes and Ideas for Bridal Shower Centerpieces! Origin and History of Bridal Shower Centerpieces! Understanding the origin and history of table Bridal Shower Centerpieces it is easy to understand how the concept of Bridal Shower centerpieces evolved. 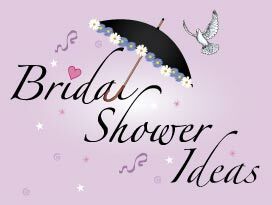 The word 'shower' is used to describe a party of friends assembled to present gifts (usually of a specified kind) to a person. The tradition of giving parties for wealthy brides-to-be started in America during the late 1700's. The popularity of this type of party steadily grew as the wealth of people increased. It has now become an American tradition which is being adopted across Europe, especially in the U.K. And, as with other traditions, such as the tradition of creating wedding centerpieces, Bridal Shower Centerpieces were gradually created! Throw a party! Themes! Balloons, Ideas for centrepieces! Our selection of Bridal Shower Ideas includes our unique printable Bridal shower invitations. Top ideas for Bridal Shower Centerpieces! Fully personalized and homemade Bridal shower invites and thank you cards are not only easy to make and print with the addition of photos but are also cheap to make!